Admit it: You watched Marina Shifrin’s “I Quit” video with giddy delight. You mentally pumped your fist in solidarity, maybe even fantasized about your own choreographed kiss-off to your employer. Based on the 15-million-and-counting views Shifrin’s video has received, many people have dreamed about leaving a job and publicly slamming the door on the way out. Still, most of us know better than to burn bridges with such a foolhardy stunt. But even if you’re not making viral videos, the technology you use every day could be telegraphing your dissatisfaction to your employer and jeopardizing your current job—and your next one. It’s natural to notice a coworker’s questionable attire or a VP’s tendency to arrive late to work. Kept to yourself or voiced through proper channels, it’s also harmless. But sharing bons mots about ugly shoes or poorly divided workloads through the tools you use every day—email, instant messaging, texting, social networks—can quickly undermine your job. When you’re communicating through tools that connect you with hundreds of people inside and outside the office, one errant mouse click can put your thoughts in front of a very unappreciative audience. Wrong chat window, wrong email recipient, email innocently forwarded beyond your target reader—you might as well queue up outside the HR office. Complaining over company email or IM is no better than complaining in a loud voice by the water cooler, as this completely scripted screenshot suggests. Communication gaffes aren’t the only way to end up on your employer’s radar, though. Much more common is the seemingly innocuous venting many of us do through our social media accounts. Pouring out your woes about your company’s bad coffee or stingy work-at-home policy makes you look like a malcontent. Complaining about shouldering too much of a project due to a coworker’s ineptitude? You’d better make sure that your Facebook friends don’t know someone in your workplace—and never will. Fantastic employees may not have to clean out their desks because of one snide tweet (though you still may want to delete it). But for employees with less-than-glowing performance reviews, such slip-ups are likelier to be the straw that breaks the camel’s back. A sixteen-year HR veteran of several tech companies, Schwab has had to show tech-abusing employees the door on various occasions. A pixel trail is harder to delete than a paper trail. Once it's data, you can't take it back. You may think that if you’re going to leave the company anyway, your conduct doesn’t matter. But technology immortalizes every moment, including ones you wouldn’t want to revisit during a job interview. Managers may be leery of someone who resigns in a public forum such as YouTube, and no one wants to manage someone who criticized their previous boss in front of 1500 Facebook friends. Most employers still check references—and that’s where chat logs and email threads can come back to haunt you. Captured complaints at one job remain part of the record and can hurt even a “golden employee” who leaves voluntarily. Moving on to greener pastures is hard when you still have manure stuck to your shoe. “Sometimes a recruiter will tell me, ‘I googled someone, and I found some photos, so we’re going to pass,’” says Julie Rogers, director of human resources at software company Atlassian. 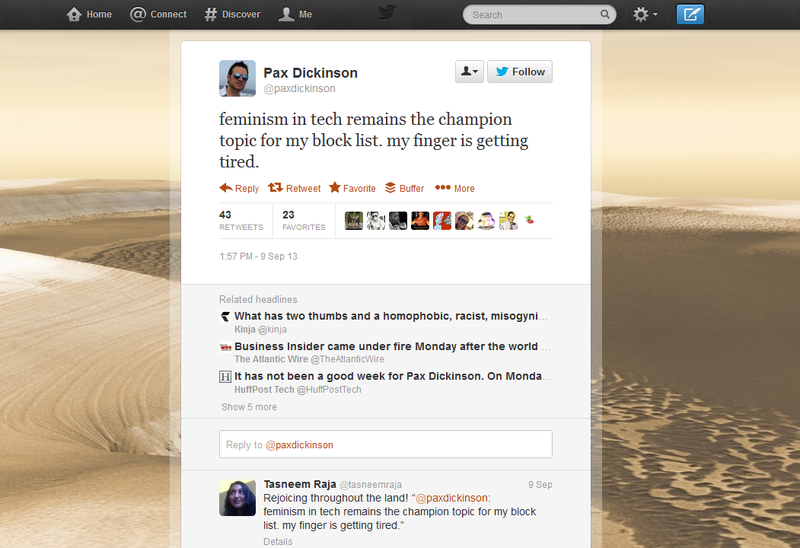 Last month, CTO Pax Dickinson parted ways with Business Insider after his...colorful...tweets came to his then-employer's attention. An employer’s search goes beyond the first page of Google results. Adler says he would “absolutely look at Facebook and Twitter” to evaluate a candidate. And if negatives surface—even after a promising interview—busy recruiters will move on to the next candidate instead of inviting a contender to explain red flags. “They just don’t have time to deal with it,” he says. Schwab doesn’t hunt down employees on social networks, aside from career networking site LinkedIn. But while she won’t be estimating the level of alcohol consumption in a series of Instagram party pics, another interviewer might. Their motivation isn’t a love of digging for dirt, but a desire to avoid having that dirt smeared on their company. And though you know that you would never cuss out your boss the way you did that other-wing political nutjob online, your prospective employer doesn’t. If you can’t keep your private life private and your casual conversations civil, you raise doubts about what you’ll do with company secrets or how you’ll behave in meetings. That atmosphere of uneasiness doesn’t lead to job offers. When you’re reeling from a bad day—or from an accumulation of so many bad days that you feel the need to change jobs—don’t let your tech tools document your less-than-interview-worthy grumbles. Your thoughts may be fleeting, but once they become data, they can dog your footsteps forever. Likewise, when you record your personal life online, think about how it would look at work. Keep your conduct professional, and you’ll keep your professional options open. 1. Check your reputation. Google yourself. If the results would cause your boss to raise an eyebrow, get sites to remove the controversial material. 2. Be aware of time-and-date stamps. Even if the content in question is innocuous and has nothing to do with work, a tweet or Facebook comment indicates exactly when you’re not working. Save your social networking for outside business hours. 3. Keep the commentary off company property. Your company owns more than office space. It owns the computer, the network, and perhaps the mobile devices you use, and it can call those back at any time. Chat logs are forever. 4. Never name names. If you feel the need to make an unflattering observation about your boss, don’t do it by name—even when posting anonymously on a look-inside-the-company site such as Glassdoor. 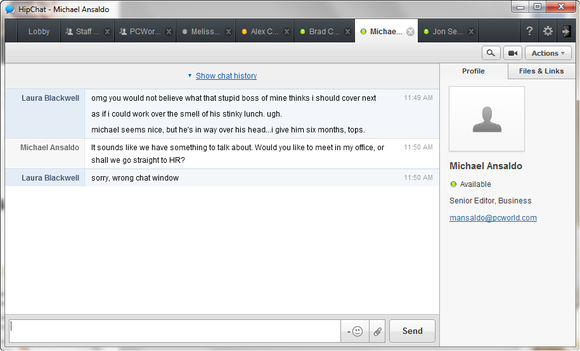 A simple egosurf by your boss may turn up your remarks, and your distinctive writing style may lead right back to you. 5. Don’t post anything about work on a public forum—or even a semipublic forum. You can keep your social network privacy settings high, but you can’t control another person’s privacy settings. Cut-and-paste makes your zingers easy to share, and you never know how clueless your Facebook friends are until you catch them at it. 6. Don’t expect pseudonyms to stay secret. It’s tempting to keep an anonymous blog or Twitter feed that chronicles your misery. But even if you do it on your own time and equipment, any details you introduce—conversations, locations, situations, and the like—contribute to a mosaic that looks just like you. And if you let anyone else in on it, you lose control of the information you share.